VH Steamers Coupon is a printable coupon that you can find on Metro’s website. Visit Metro website only, click on Metro’s coupons, select VH Steamers coupon and print it off. Bring in your printed coupon and save money on VH Steamers. VH Steamers coupon to Save $1.50 when you buy any VH Steamer Entree. 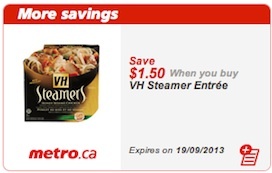 VH Steamers coupon is valid only in Metro stores across Canada. It expires Sept 19, 2013. I found it at Walmart for $2.97, so if you find it at Metro for more than $4.47, it would be a better deal if you buy it at Walmart. 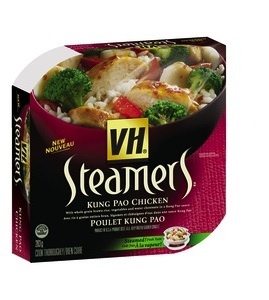 VH Steamers Kung Pao Entrees is a mouthwatering meal of juicy chicken, whole grain brown rice, broccoli, red pepper and water chestnuts covered in a Kung Pao sauce.